In some ways, pub quizzes are a beautiful symphony of contradictions. Patrons dull their minds and memories with plenty of beer and booze, then attempt to answer harder and harder trivia questions. It’s a classic barroom pastime that has been around for decades. Like many things, however, it was just a matter of time before someone took a cool idea and turned it completely on its head. It’s almost elegant in its simplicity. Each location is provided with an 8 round quiz created by the staff based in Denver. Each quiz contains two audio rounds – usually one “name that tune” type round with a clever twist, the other featuring clips from movies, TV shows and other media – and one visual round (a pre-printed sheet with eight images that need to be identified). Patrons gather in teams of no more than six (this is strictly enforced), create a clever (and usually obscene) team name, and go about working together to answer the questions. The questions themselves are designed to be both challenging (moreso as the quiz moves along) as well as humorous and entertaining. The quizmasters themselves are hired for their performance skills and ability to work the crowd. In between rounds, bonus questions are asked and other games are played. The quizzes are free to play (with some exceptions – see below) but the winning team usually ends up with a gift certificate to the venue they’re playing at. 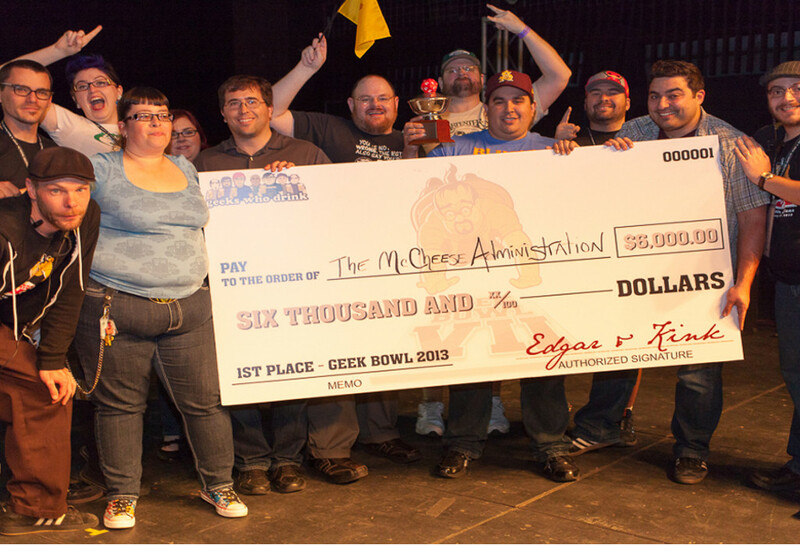 Geeks Who Drink is also known for two other quizzes – the “theme quiz” and the annual Geek Bowl. The theme quizzes are just that – an entire quiz dedicated to one topic. Topic in the past have ranged from Seinfeld, Game of Thrones, Arrested Developmenet, Joss Whedon properties and other pop-culture touchstones. These usually require a small entry fee, but the fees are gathered together for a cash prize to the winners. Geek Bowl, the “mother of all quizzes” has teams gathering from all over the country and journeying to Austin for one gigantic trivia fest. It’s more than just a chance to gain prizes and fleeting fame – it allows Geeks Who Drink fans to mingle with like-minded souls from all over. John W. Smith has been a host for over four years and this past Spring took over the role of Marketing Director for the whole company. He took a moment to discuss with us his job, what GWD has done for Austin and special events to look forward to. Austin.com: Thanks for taking time to talk to us, John. How long have you been with Geeks Who Drink and how long have you been in charge of marketing? John W. Smith: I’ve been with Geeks for about four years, the bulk of that hosting at the late, lamented Highball– may she return soon. I’ve been the Director of PR and Marketing since April of this year, so around six months. JWS: It’s a unique position. I’m possibly — probably even — the only pub quiz marketing director in America, maybe even the world. It’s a wide ranging gig that covers a bunch of bases. That means I’m managing and extending our social media presence, working with our venue partners to boost attendance, exploring our advertising options online and off, brainstorming national promotions like Rumble in the Pub, collaborating and coordinating with our various departments on sponsorships, taking care of press outreach for our special events, and helping put together some of our big events like Geek Bowl. AC: Pub quizzes are nothing new. In your own words (or steal someone else’s, I guess), what makes Geeks Who Drink different from all those other wannabes? JWS: Hate to generalize, but many or most of our competitors have a shorter, less inventive and more ho-hum game — twenty questions with a song played in between, a lot of them put together by guys who’ve got two or three good quizzes in them, not dozens or hundreds. Our quizzes are eight rounds of sixty-four questions that includes two audio rounds and a visual or video round, written and fact-checked by a staff of dozens and edited by a six-time Jeopardy champion. Once a bar hires us we take care of a good chunk of the tough stuff. For instance, we take care of the hiring, training and management of our quizmasters (hosts). We also supply our bars with posters, coasters, table tents and other marketing collateral. AC: Geek Bowl has been in Austin for the last couple of years – what was the impetus for that change and how has it worked out so far? JWS: It was a practical thing. Three years ago the venue we’d been using in our home base of Denver wasn’t available in our normal timeslot, so we looked around at other options. Austin’s a destination city and we found that it’s a hell of a fit. For the first time this year we’ll be doing Geek Bowl at ACL Live at the Mary Moody Theater, which’ll fit over a thousand competitors for the country’s largest trivia event. AC: How quickly has GWD spread across Austin? It seems like I can hardly go to a bar that doesn’t host a quiz night by you jokers. JWS: Austin was the third region our quiz spread to and it’s one of the largest– we have around 30 venues in the region. Denver still has more Geeks venues, but Texas is now the biggest of our 29 states. AC: Finally, what are some special GWD events coming up in the next few months in the Austin area we should know about? JWS: Boom– right now we’re running a regional tournament called Rumble in the Pub, we’re doing a special Doctor Who quiz on November 16th at Opal Divines Penn Field, we’ve got Geek Bowl VIII on January 25th (tickets on sale in mid-December), and in 2014 look for Harry Potter, Game of Thrones and Seinfeld quiz events. For more information on Geeks Who Drink, including finding a quiz night near you, visit their blog/website.